San Diego County is home to over 90 professional brewhouses – the most of any county in the nation. 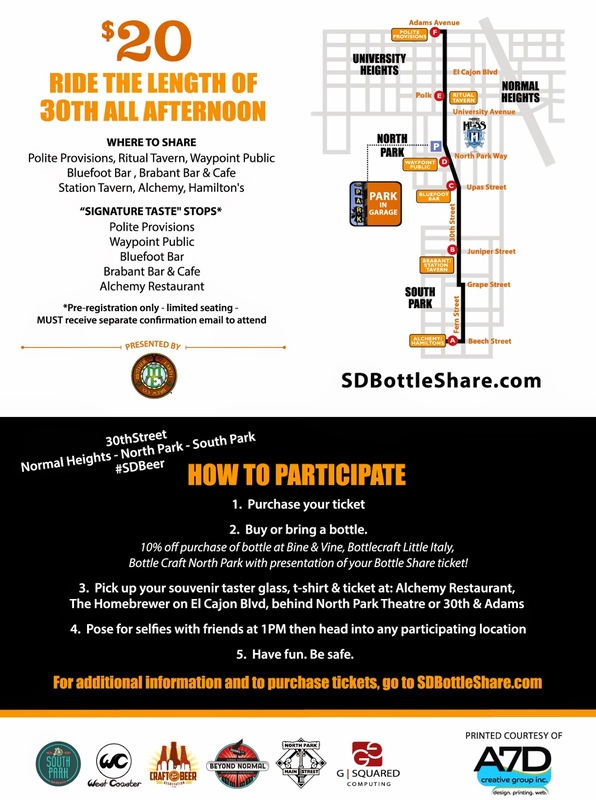 In celebration of San Diego Beer Week, beer lovers 21 and over will go for history and a Guinness World Record as the World’s Biggest Bottle Share will be held Sunday, November 9, 12 to 6pm, along 30th Street, from Adams Avenue on the north to Beech Street on the south. “A bottle share usually involves a group of friends or enthusiasts getting together to try great craft beer,” said Omar Passons, one of the event organizers and co-founder of the Craft Beer Association of San Diego. The eight local businesses who will participate as bottle share locations are Polite Provisions, Ritual Kitchen & Beer Garden, Waypoint Public, Bluefoot Bar & Lounge, Brabant Bar & Cafe, Station Tavern, Hamilton’s Tavern, and Alchemy Restaurant. In addition to the bottle share, several of the region’s most heralded brewers are partnering to offer special signature tastes throughout the event, plus more than 50 distinctive restaurants and bars will be open along the 30th Street route. For $20, participants will get a commemorative t-shirt, a 5-oz taster glass, and unlimited trolley transportation during the event. A select group of pre-registered attendees will also get to sample special tastings from area brewers. For tickets and more information, visit SDBottleShare.com.